Gillian Larson had an unexplained passion and drive to get onto the TV show Survivor and after 8 years of applying she got on for the season filmed in Gabon, Africa becoming the second oldest woman contestant ever and only 1 of 9 contestants over 60 in all seasons to play. She applied for 8 years, was ready and prepared to play for 39 days and love every minute of it but played for only 6 days. Little did she know as her Survivor flame was snuffed out the flame of Reality Rally was being ignited. Saddened and disappointed she started walking 5 hours a day in the jungle thinking what can she do with the experience that perhaps was the root of that passion to play. Suddenly realizing what she had in her hands, Reality Rally stated forming. Celebrities, Charity, City of Temecula became her “Fun for Funds” idea. She had read Michelle Watson’s story, www.michellesplace.org, and knew that this was the cause she would support with the same passion she had for Survivor. She knew that Reality Stars and other mini celebrities now have that opportunity to do good with their “fame”. She just knew Temecula would embrace an event that would bring in money and exposure from all over the world due to the Reality Star following. Forming her event tag line “ Nobody makes a greater mistake, than he who did nothing because he could only do a little ” Edmund Burke. was the seed she knew would germinate and grow as Reality Rally would be drawn to the idea for many to be able to do a little that would amount to a lot benefitting many in many ways. She just knew that people do want to do something and just need that vehicle to do it. That seed planted in Gillian’s heart, started with a budget of zero and no funding and due to a Production Team of 48 and over 600 people making it happen it is going into their 3rd year, Reality Rally has become the premier Reality Star event it is, one of Temecula’s most attended events bringing in money from over 12 countries and every one of the 50 States. It attracts people who want to do “a little” from 37 States and approx 512 cities around the world to play, party, sponsor, donate and volunteer. Hundreds of Reality Stars coming from over 30 shows have raised funds and attended without compensation and the So Cal Surf Dogs and other schools and organizations have been a part of the weekend attractions. 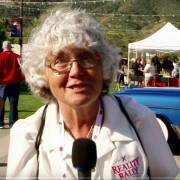 www.realityrally.com is watched in over 96 countries and talked about in 46 languages. How does one explain the involvement and excitement……passion, belief and an honest interest in others. Gillian devotes endless hours a week to this passion, does not draw a salary and is in awe at how it all comes together. The weekend of “Fun for Funds” is a full weekend opportunity to mix and mingle with the Reality Stars you have watched on shows and spend time with friends and family just having fun for a great cause. Weekend events are a golf tournament, a Celebrity reception at Wilson Creek Winery, Autograph signing, an Amazing Race type game all over Old Town Temecula for the public to play with the Stars completing 13 Challenges put on by 13 Temecula organizations, A Kids challenge Field, a Red Carpet Celebration party at South Coast Winery, after parties at Pala Mesa Golf resort and The Stampede and a volunteer appreciation, Breakfast with the Stars. For full information and to see the event captured by our 24 Imagery Team Volunteers browse the entire website, www.realityrally.com. Gillian encourages YOU to do “your little to amount to a lot” today. In order to fully appreciate the amazing event Reality Rally has become, you must know the story. How did an event of this magnitude spring from the depth of disappointment. Why do over 110 Reality Stars from over 30 TV shows flock to Temecula every April. What draws over 600 volunteers to participate and make it what it is. Why do their amazing Sponsors help provide almost everything we eat, read, listen to, play and enjoy at prime venues throughout the town of Temecula California. What encourages the Temecula organizations to be the Challenge Checkpoints in the Amazing Race type game. A young Golden Retriever and semi-pro surfer, Ricochet, rode the waves to victory on Sunday at a California annual dog Surf-a-Thon, but it was a novice therapy dog that emerged from the water as a new star to watch. More from the Surf Dog Ricochet website. A weekend of Fun for Funds to benefit Michelle’s Place, our area cancer resource center. Full information on the 2013 event – being held April 4 – 7 – will be posted online as details become available. Sign up for the newsletter to be kept informed.